Cranial osteopathy can be effective in assisting the body to recover from fractures, surgery and head injuries. 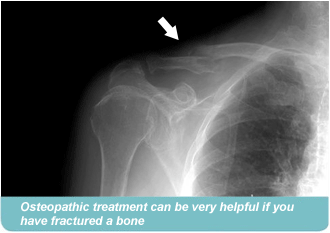 Osteopathic treatment is also very helpful if you have fractured a bone. The area around the fracture will be disorganised and shocked as a result of the break. Cranial osteopathy will quickly and very directly assist the damaged site to regain a sense of continuity and balance which then enables the physiological processes of healing to work more effectively through the disrupted tissues; speeding up local recovery and helping the body as a whole. Even if there is a cast splinting the fracture, the treatment will 'reach' the fracture site. We will also ease any challenges affecting the rest of the body due to the weight of the cast, the effects of slings, having been in traction, or periods of immobilisation. Though our treatment is named 'cranial' osteopathy, it is important to point out that we can work on any area of the body in need of help using this very gentle approach. Be it emergency or planned surgery, an osteopathic treatment soon after the surgical intervention will help restore normal motion and physiology to organ systems, and aid healing and the re-balancing of strains in soft tissues that have been cut, bruised, or displaced during the surgical procedure. Our treatment also helps the body to release the shock that very commonly occurs as a result of surgery, and enables the body tissues to clear any lingering effects of anaesthetics. Even minor blows to the head (or the birthing process for newborn infants) can cause disturbance or injury to the delicate tissues of the brain and its protective coverings. The subtle precision of hands trained in cranial osteopathy can very gently help restore normal motion and functioning to all the tissues of the head and neck, including the central nervous system, thus enabling the body's inherent self-healing mechanism to express itself at its optimum capacity in areas that have been injured. The normal healthy state of the brain and spinal cord is one of being 'suspended' and free to move, 'floating' in cerebrospinal fluid. Even small limitations to this system can create marked effects, which is why cranial osteopathy can produce such beneficial changes. "I recently had major surgery of orbital bi-lateral and lateral decompression which caused major swelling and nerve damage to my eyes and face. I saw Rebecca 1 week after surgery and then every week for 3 weeks. After our first session some of the damage to the nerve endings starting to spring back to life, gradually over the next few weeks I have all the feeling back in my skull and face, much to the surprise of my surgeon who thought it would take a few months. I had a lot bruising in and around my right eye which is almost back to normal, Rebecca has made a remarkable effort in getting me back to health, I sleep better and have more energy during the day, I believe that with Rebecca's help my recovery has been quicker and less painful than expected." "Many thanks to Vikasini - I've had effective osteopath treatments before but the one that will stay with me as the most influential was a few days after I had my gallbladder removed. Not sure how my mother was even able to get me into the clinic but I was thankful she did. I felt during the treatment a sense of calm as if a deeper balance was happening and that seemed to initiate a healing flow that was not there previous to the treatment - in fact I felt shut down and in a state of trauma. I think surgery can be very traumatic to our whole being, so it makes sense to me why the cranial treatment was so powerful as I have found always a systemic positive shift. Thanks, I'm a true believer and refer my family and clients to Vikasini."